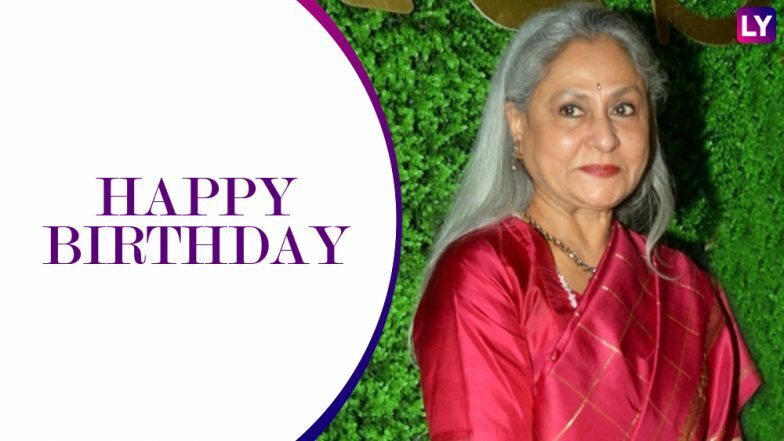 Bollywood's much-acclaimed actress Jaya Bachchan celebrates her birthday today and we are thankful for this star to have given us some amazing films during her career. As the actress turns 71 today and we look at some of the best films she has been a part of. One of the reasons why Jaya Bachchan became a popular actress of her time is because of her extremely realistic acting. She first made her debut as a teenager in Satyajit Ray's Mahagar (1963) and later made her big acting debut with Hrishikesh Mukherjee's Guddi(1971). She later went on to star in some of the biggest films including Sholay, Abhimaan, Milli etc. Here are some of her best works that you must watch. If you are a fan of the couple of Amitabh Bachchan and Jaya Bachchan, you have probably seen the two acting dynamited explode your minds in this film. Abhimaan is one of the most iconic films to have dealt with a couple facing problems in their marriage owing to their careers in the same field. Male ego was portrayed extremely well in this film and Jaya Bachchan's demure act of a singer truly in love with her partner played by Amitabh Bachchan was moving. Since Jaya Bachchan's acting has been popularly known to remain high on reliability, it is films like Kora Kagaz that won her most praises. The 1974 film with its simple storyline but superlative performances won the audience's hearts. Jaya Bachchan even managed to win a Filmfare Award for the Bes Actress for her performance in this film. The film is considered to be one of the most classic love stories in Bollywood. Directed by Anil Ganguly, the film starred Vijay Anand as her male lead. Sholay is one of the most iconic films of Indian cinema and the multistarrer with some big names such as Amitabh Bachchan, Dharmendra, Hema Malini and Jaya Bachchan in lead roles. Bachchan played the role of a young widow in the film who later falls in love with Amitabh Bachchan's character in the film. What's interesting is that her character has starkly opposite personalities in the film from being a lively girl to silently suffering widow. We are sure this film will always remain a special part of her career considering the kind of massive response it received. For any actress, being a part of legendary director Yash Chopra's films would have been a dream. The 1983 film brought together a stellar cast of Jaya Bachchan, Shashi Kapoor, Amitabh Bachchan and Rekha together. It is one of the rare films from the 80s to have dealt with infidelity and themes such as that. Yash Chopra was known to bring something new to the table and it was nice to see Jaya Bachchan play an interesting role in the film. . Did You Know That Aryan Khan Rubbed Shoulders With The Likes Of Amitabh Bachchan and Jaya Bachchan in His Debut Bollywood Movie? Watch Video. Even after having kids Shweta and Abhishek Bachchan, actress Jaya Bachchan continued to work. Her versatility is admirable given that she has given strong performances such as Fiza, Kal Ho Naa Ho and Kabhi Khushi Kabhi Gham even in the later stages when she wasn't actively working in films. Just like we still see her spouse Amitabh Bachchan in films and endorsements, we would love to see Jaya Bachchan continue to work in Bollywood even today.